Premium Quality Hand Scraped American Cherry Butcher Block Countertop. 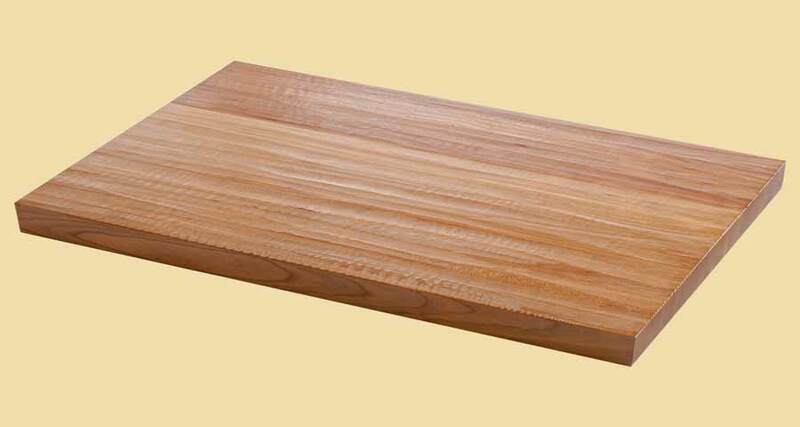 Quote and order any size hand scraped butcher block countertop! Fill in the dimensions below. American Cherry hand scraped butcher block countertops are a perennial customer favorite due to their absolutely beautiful finish. American Cherry has an even grain and a fine texture. The deep, reddish-brown heartwood, paired with a lighter colored sapwood, makes American Cherry hand scraped butcher block countertops an elegant choice for any home accent. Medium-weight, strong hardwood. Our skilled craftsman scrape these butcher block countertops by hand. Distressed butcher blocks provide a rustic and unique look to any surrounding. We have several choices for the top edges of your hand scraped top. The hand scraping may or may not run into the edge occasionally. The picture on the top of this page shows a prefinished butcher block. However, the butcher blocks on this page are sold unfinished. For prefinished, please visit prefinished hand scraped butcher block countertops.